SREB’s Go Alliance Academy strives to increase the postsecondary success of all students by providing timely and relevant professional development to school counselors and by helping colleges of education transform the ways future counselors are trained. SREB’s Go Alliance Academy College and Career Counseling Initiative works to increase the knowledge and skills of counselors who advise students on their postsecondary aspirations. Membership in the initiative provides access to a series of online training modules that can improve effectiveness in preparing all students for education after high school — especially those from low-income families who would be first-generation college students. The modules can be used for professional development of elementary, middle grades, and high school counselors, as well as school principals, teachers who serve as advisors, graduation coaches, and staff of college access programs. In addition, they may be used as an academic course as part of a master’s or doctoral degree program in professional school counseling. The modules work in a number of different ways. They are designed for online delivery, either as distinct modules for professional development credit or as graduate-level courses for academic credit. 95 percent of trainees who enroll in the online format are able to complete the module. States also can offer training in either a hybrid or face-to-face approach by using a subset of the modules for in-person professional development workshops. Master’s degree programs can use the existing modules or crosswalk the materials and incorporate content into existing academic courses. The content can also be customized with specific information about postsecondary options in a particular state, including state-specific careers, graduation requirements, college planning tools and resources, and scholarships. A 2017 survey of more than 250 trainees in six states found that, six months after enrolling in the training, 86 percent of counselors reported having changed their practice because of the training; 88 percent had started to implement the action plans developed as part of the training; and 95 percent would recommend the training to colleagues. State agencies, school districts, and non-profit organizations wishing to join the Go Alliance Academy should contact Alice Anne Bailey at aliceanne.bailey@sreb.org. Brochure describes the Go Alliance Academy and its courses to deepen your knowledge about college and career advisement. The content, developed by experts in the field, is current and relevant. And the digital platform is state-of-the-art. New resources are available to help school counselors and college access advisors assist students during the college admission process. The Council of National School Counseling and College Access Organizations has launched a new website containing tools for college advising. SREB’s Go Alliance has expanded and relaunched its online training for college and career counseling. 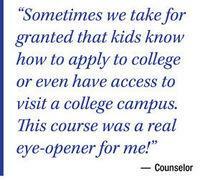 The program is designed for school counselors, principals, teacher-advisors and other educators. As director of the Southern Regional Education Board’s Go Alliance, Alice Anne Bailey helps states develop and implement policies, support programs and communications techniques to increase the number of students who would be the first in their families to attend college. She also directs the Go Alliance Academy, which provides rigorous professional development and education for in-service and pre-service school counselors and educators. At SREB, she has managed many multi-state education projects and authored numerous reports that range from middle grades to adult education. Read our brochure to learn more!